Our lives are defined by the decisions we make each day whether we are selecting a restaurant or considering a cross-country move, we shape our lives. The decision-making process can be empowering, allowing us to enjoy the benefits of self-determination. Yet it can also be a source of anxiety because decisions force us to face the possibility of dissatisfaction and inner conflict. As a result, many of us opt to avoid making decisions by allowing others to make them for us. We consequently turn our power over to spouses, relatives, friends, and colleagues, granting them the stewardship of our lives that is ours by right. Though the decisions we must make are often difficult, we grow more self-sufficient and secure each time we trust ourselves enough to choose. Ultimately, only you can know how the options before you will impact your daily life and your long-term well-being. Within you lies the power to competently weigh the advantages and disadvantages of each selection. Even if you feel incapable of making a decision, your inner wisdom and your intuitive mind will give you sound counsel if you have faith in yourself. Try to come to your own conclusions before seeking the guidance of others, and even then, treat their suggestions as supplementary information rather than votes to be tallied. When your choices are your own, you will be more likely to accept and be satisfied with the outcome of those choices. Your decisions will be a pure reflection of your desires, your creativity, your awareness, and your power. Since you understand that you must live with and take responsibility for your decisions, you will likely exercise great care when coming to conclusions. This was shot was taken at The California State Railroad Museum. The museum features 21 restored locomotives and railroad cars, some dating back to 1862. The “Sierra Scene” shows a large scale mockup of a construction scene high in the Sierra Nevada representing Donner Pass circa 1867, featuring the locomotive Gov. Stanford. Other exhibits show how the influence of railroads changed American society, influencing travel, commerce and daily life, as well as the lives of railroaders and the diversity of people who work on railroads. Changing exhibits featuring photography, ephemera, and artifacts from the museum’s collection, add depth and incidental information to the overall story of railroad history. 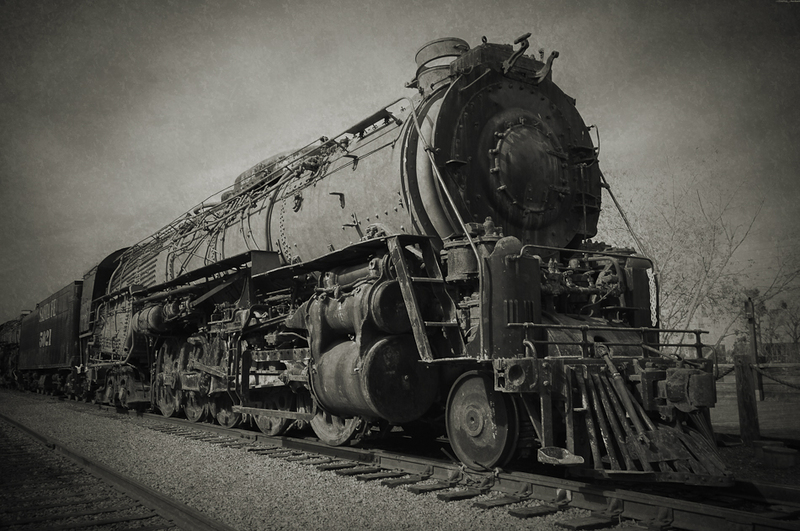 The Museum has an extensive educational program for elementary students from across the region to help them learn about railroad history using re-enactments, costumed docents, and including train and handcar rides. We discovered this unusual image after carefully exploring the California Train Museum in Sacramento. The details of the mechanisms used to propel these ancient beasts is absolutely fascinating. 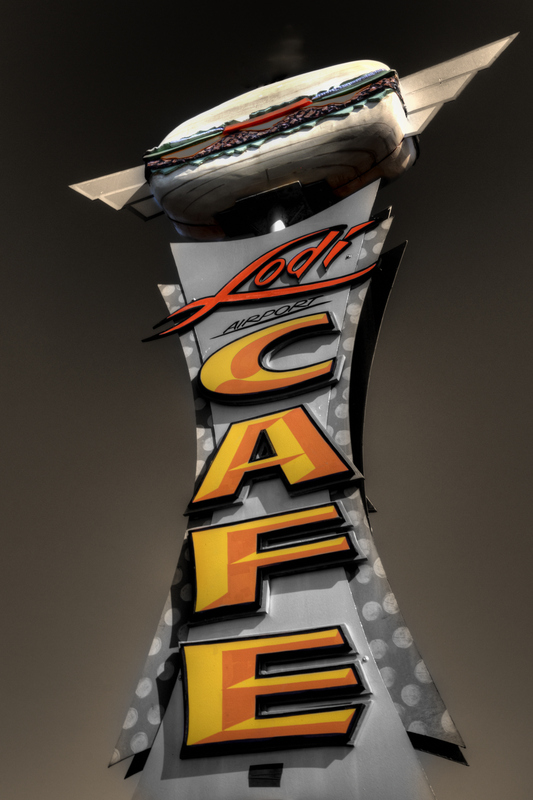 It appears then someone wanted to add a bit more character to this behemoth with a bit of their own styling. Wonder who she is? The “Ghost in the Machine” is the British philosopher Gilbert Ryle’s description of Descartes’ mind-body dualism. The phrase was introduced in Ryle’s book The Concept of Mind (1949) to highlight the perceived absurdity of dualist systems like Descartes’ where mental activity carries on in parallel to physical action, but where their means of interaction are unknown or, at best, speculative. In addition, Ghost in the Machine is the fourth album by The Police, released in 1981. The group released three successful singles from the album: “Every Little Thing She Does Is Magic“, “Invisible Sun“, and “Spirits in the Material World“. It went multi-platinum in the United States. The album was listed #322 on Rolling Stone’s 500 Greatest Albums of All Time. This was taken prior to a Vintage Car Shoot on the runway – recall an older post (https://kerstenbeckphotoart.wordpress.com/2011/04/13/the-periwinkle-princess-by-tish-and-rich-riley/). We had breakfast at this wonderful Cafe and watched as anxious first time parachuters lined up every 30 minutes to be whisked into the blue and dropped onto the green! 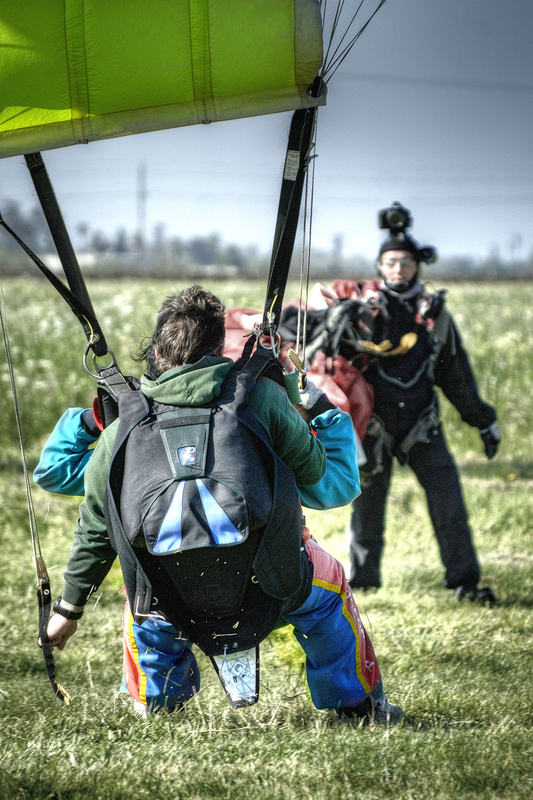 Note the instructor equipped with cameras on his helmet! 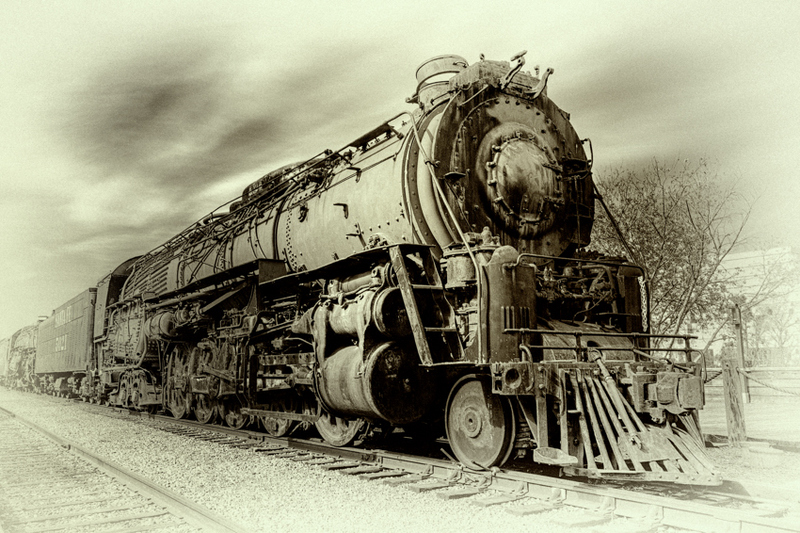 This is another look at this spectacular Locomotive in Sacramento, California. I took some liberties to reflect an image of a vintage postcard. I can imagine this might have been the last communication from a broken heart. We spotted this rather well-preserved Douglas DC-2 at the airport in Lido, California. 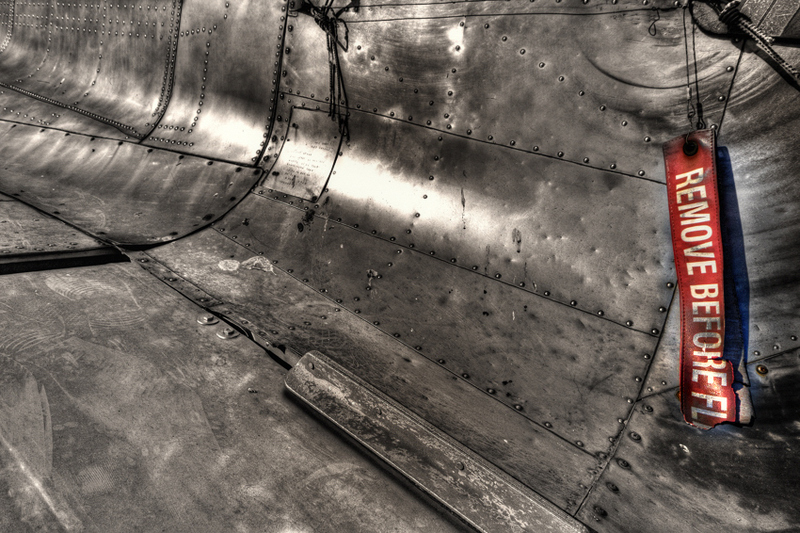 What struck me where the number of rivets and sections of aluminum that made the skin this superb aircraft. This is a view from the rear of the aircraft. Give its immense size and where it was parked, it was impossible to get the entire plane in view. The Douglas DC-2 was a 12-seat, twin-propeller airliner produced by the American company Douglas Aircraft Corporation starting in 1934. It competed with the Boeing 247. In 1935 Douglas produced a larger version called the DC-3, which became one of the most successful aeroplanes in history. In the early 1930s, fears about the safety of wooden aircraft structures (responsible for the crash of a Fokker Trimotor compelled the American aviation industry to develop all-metal types. With United Airlines having a monopoly on the Boeing 247, rival Transcontinental and Wester Air issued a specification for an all-metal . 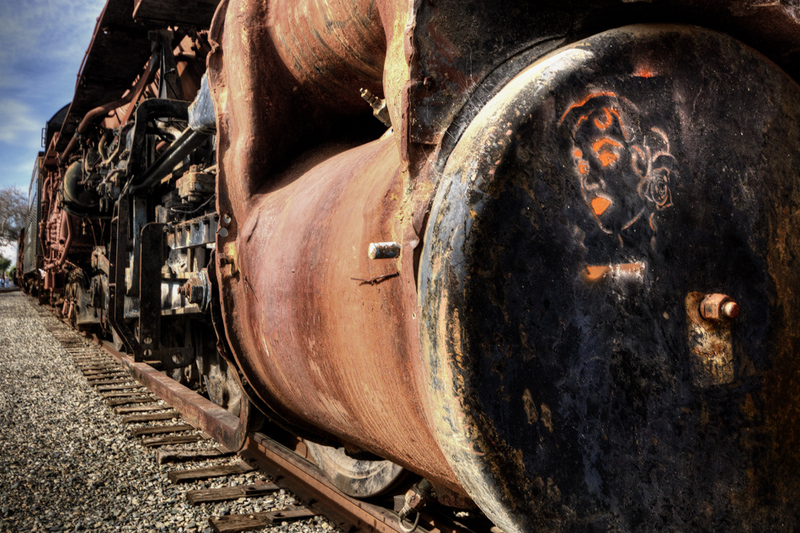 This was shot during a visit to Sacramento’s Old Town and Train Museum. 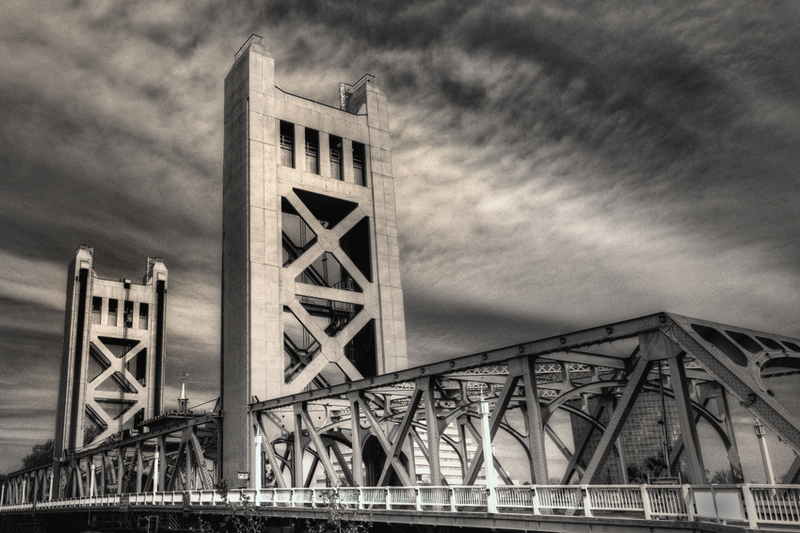 The Tower Bridge is a vertical lift bridge across the Sacramento River, linking West Sacramento in Yolo County to the east. 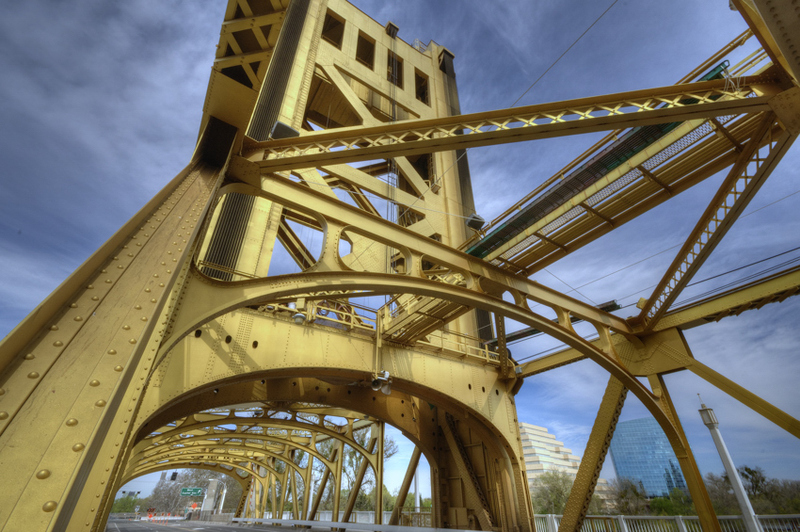 In 1911, construction was completed on the M Street Bridge in Sacramento. 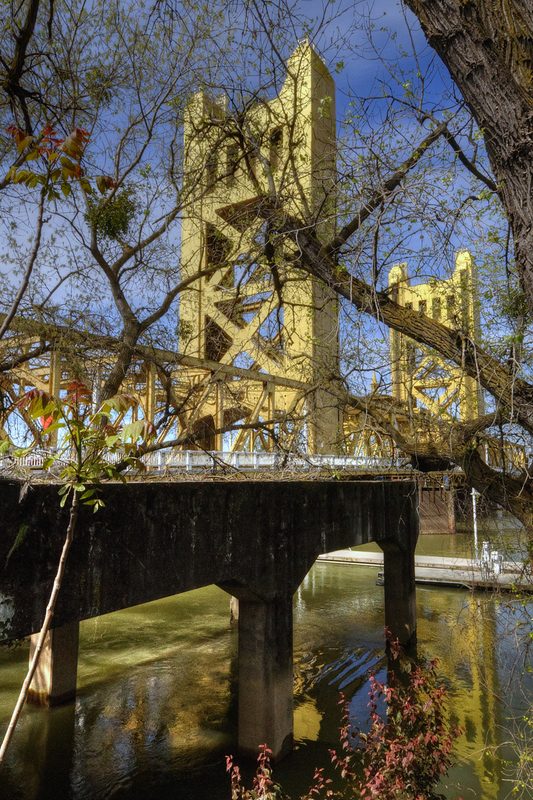 In 1933, the city realized that it needed a better crossing over the Sacramento River in case of war, and that the existing bridge was highly inadequate to handle heavy traffic. In 2001, as the old paint job could hardly be distinguished, residents who lived within 35 mi (56 km) of the capital voted on a new color scheme. Their choices were burgundy, green, silver and gold; or all gold. The winning color was all gold, and it was repainted in 2002. 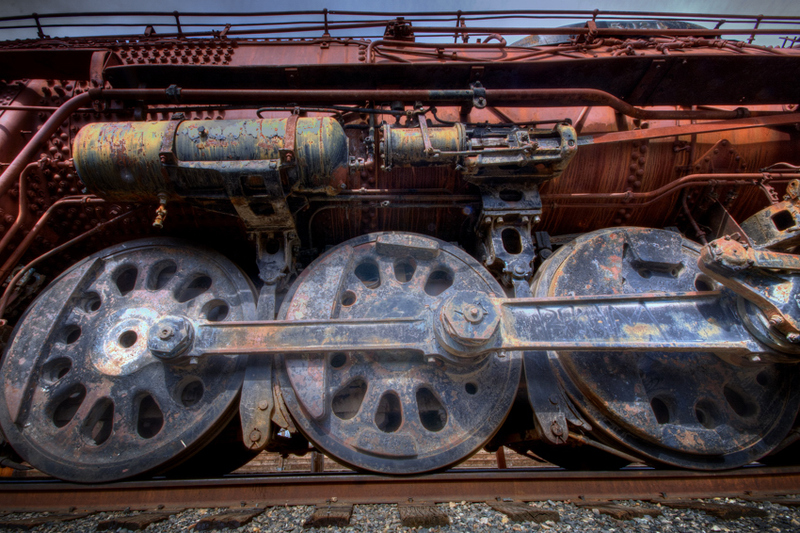 This was taken using a Gorilla Pod strapped to a railroad track to stabilize the camera – I love this portable Tripod! I was intrugued by the complexity of this fine Engine and wanted a low perspectice to capture the power it once harnessed. The California State Railroad Museum in Old Sacramento is a tribute to the role of the Iron Horse in connecting California to the rest of the nation.